Very nice new feature in Gmail Labs: undo sent email. Gives you a few seconds after sending an email to change your mind and cancel it. Now we just need some way to reach into somebody’s email a few minutes or hours later and delete poorly thought out messages. I wonder if anyone would object if Gmail let you recall messages sent to another Gmail account at any point up until they are read. AOL used to let people do that (it wasn’t a bug it was a feature). Gmail has finally added support for Google Gears. This is great if you feel the urge to type an email or need to look something up while stuck in the Moot Court Room. Or if you’re annoyed by the intermittent connectivity in other areas of the school (ever click on a message and have to wait five minutes for it to load?) Gears will overcome that by caching all your email on your computer. Enable it in Gmail Labs (Settings->Labs->Offline) and then click the new “Offline” link that appears in the upper right of Gmail. It has now been a few months since I switched to Gmail. Here is what I’ve learned. Better Gmail 2 is a collection of Greasemonkey scripts that customize the Gmail interface in various interesting ways. 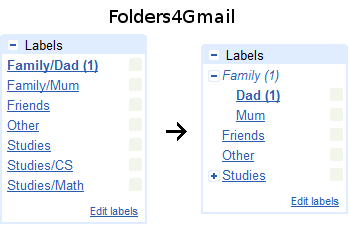 Folders4Gmail allows you to create nested labels. There’s a script that moves the new mail count to the start of the window title (so you can see it when the end of the title is cut off in a tab or the taskbar). You can hide the chat and invite boxes in the left column. Good stuff. Gmail S/MIME lets you send and read signed and encrypted mail. You’ll also need an email certificate (Thawte has good free ones). From: (prof.one || prof.two || prof.three)@utoronto.ca, Label with: "P/UTL"
What does it do? Any email coming from one of the specified professors (just a list of all my profs) gets labelled as being part of the law school project. I wish Google would just let you create contact groups and label email from the group, but this is close enough. Every once in a while I see people checking their email and they have hundreds of read messages in their Inbox. The greatest feature of Gmail is “archive”. After you read an email, click the “Archive” button and it disappears from your Inbox. But where did it go? It’s still there; it’s in the “All Mail” view at the left side. But if you happen to be one of those people with hundreds of messages in your Inbox, you’ll be amazed at how much better it feels to only have one or two. Of course, if you want to leave it in your inbox (to finish reading later, perhaps) then you just leave it there. Just use the Inbox for stuff you haven’t read or that you intend to re-read imminently. If you use Remember The Milk, then there is an extension that not only puts your Todo list in the sidebar on Gmail, but can automatically create tasks and link them to a specific email when you Star a message. I am considering getting rid of Remember The Milk and just sending myself emails with Todo items and using Gmail to manage my Todo list completely. I might steal from GTD a little more and make S/Action, S/Complete, etc labels. Remember The Milk is great, but it’s just another service that I have to pay attention to. The University of Toronto claims that there is some difficulty in forwarding messages to Gmail but they are terribly unspecific. I have a filter to prevent email from the school from being marked as spam, but they seem to indicate that the problem isn’t simply that. So instead of forwarding my utoronto.ca email to Gmail, I’m using POP to collect it. That should reduce the chances of Gmail bouncing a forwarded message (not that this seems very likely to begin with). Of course, it introduces the possibility of a delay since Gmail only checks every hour, but you can always force it to check for new email now if you’re expecting something. There is also this post on backing up Gmail.